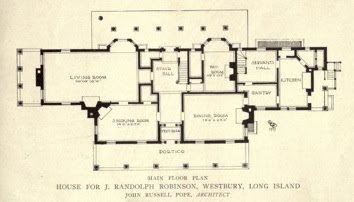 The J. Randolph Robinson estate designed by John Russell Pope c. 1917 in the Wheatley Hills. Landscaping was done by Ellen Shipman. Robinson was the New York rep for Hardison, Walker & Co., a brick manufacturing firm located in Pittsburgh. 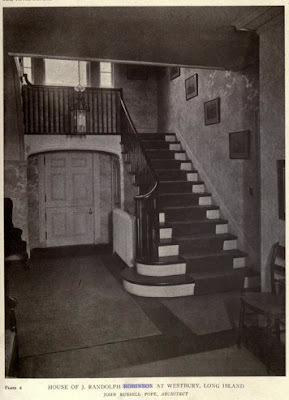 In the 1920s the house was purchased by Philip Grossler, president of Columbia Gas & Electric Company and director of the Guaranty Trust Company. He hired Pope to add a porch and some additions as well as having Shipman design more extensive gardens. Today the house is part of C.W. Post. Click HERE to see the house on google earth. 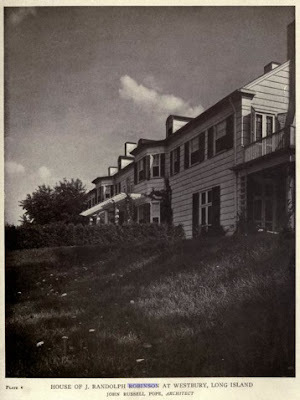 Pictures from American Architect & Architecture, 1920. It was later owned by E.F. Hutton who gave it the name Hutfield. The columns were a mistake. 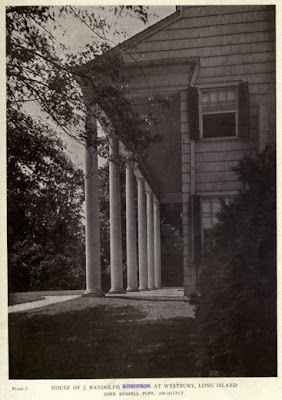 It's interesting, though to trace the design antecedents of that portico---McKim, Mead & White seem to have been the first to use it, on the James Breese house in Southampton. Then it popped up on the Piping Rock clubhouse. Pope used it on the gigantic Collier house in New Jersey, then he used it here. no, no, no - dilletante - some schmuck in south carolina used it back before the war and then these budding northern architects thought it made the mundane neo-colonials look posh. grandiose but more pretentious than grandiose. i suppose they were so busy back in the day that they didn't have time to think up something creative every time a rich person threw money at them so they fooled them with one of these Tara stick-ons. I thought you'd love this one as it has a Palladian facing the back 40. The only redeeming thing i can see is those two odd angular towers in the back, the porch at the end and the pergola but otherwise another sleep inducing neo-colonial. where was mizner when we REALLY needed him? PS - the columns look fine on a house they were designed for such as Lynnewood or Whitemarsh or Shoremond but either those architects had more time or actually wanted to create something rather than just throw something up. 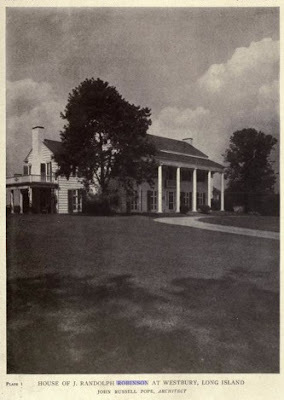 The book Long Island country houses and their architects, 1860-1940 suggests that this house was at one time owned by the Daniel G. Tenney family. The aforementioned book suggests the house passed from the Tenneys to LIU. I'm in possession of a NY Times article about a dinner dance the Tenney sons hosted on Friday, September 13, 1935, just prior to returning to their studies at Yale Law School. More than 120 "debutantes and young marrieds" of the area were in attendance. In that NY Times article the Tenney estate is referred to as "Penllyn." I can forward the article if there's interest. 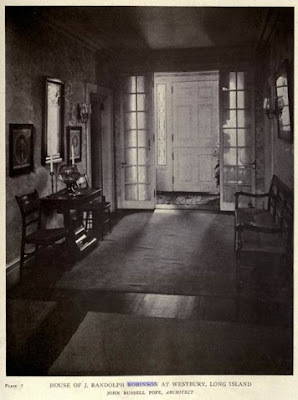 I'm attempting to clarify any information you might have that suggests the house featured in this post was the Tenney's country home Penllyn. Daniel Gleason Tenney Sr. is listed in Long Island's Prominent North Shore Families living at the Robinson place. Book also has estate "Penllyn" but for Albert Lawrence Smith, Sr. Original name was "Avondale Farms" for JW Harriman. "I can forward the article if there's interest." Please! HalfPuddingHalfSauce: Would much appreciate seeing the references, sources, articles you've come across. Do you know if one can access 'Long Island's Prominent North Shore Families' online for review? 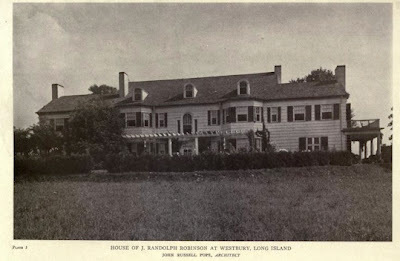 So it appears that title on the house (or residents of) would go something like this with perhaps gaps: J. Randolph Robinson; Philip Grossler; E.F. Hutton (who renamed it Hutfield); Daniel G. Tenney, Sr.; Long Island University? Discovered recently that the Daniel G. Tenney, Sr. estate called Pennlyn was in the Village of Brookville and may have later beern gifted to become party of the C W Post campus of Long Island University? Have been in touch with historian/archivist at LIU. This house was transferred to LIU via the Hutton family. 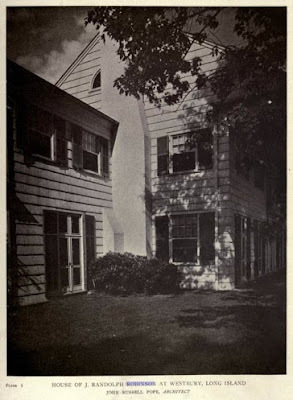 The Daniel G. Tenney Sr. family did not pass this house to LIU. In fact, the Daniel G Tenney Sr. family transferred another property to LIU which currently houses the LIU President's office among others.